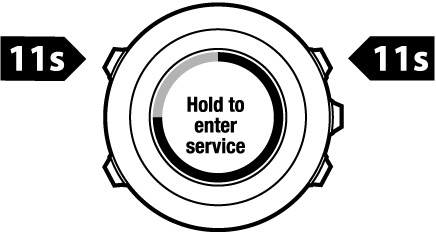 To access the service menu, keep Back Lap and Start Stop pressed simultaneously until the device enters the service menu. Version: shows the current software and hardware version of your Suunto Ambit2. Power off is a low power state. Connect the USB cable (with power source) to wake up the watch. The initial setup wizard starts. However, prior values are not erased, so you just need to confirm each step.